Remscheid (German pronunciation: ) is a city in North Rhine-Westphalia, Germany. 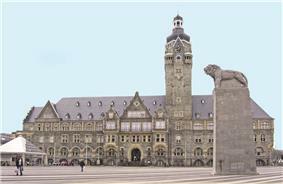 It is, after Wuppertal and Solingen, the third largest municipality in Bergisches Land, being located on the northern edge of the region, on south side of the Ruhr area. Remscheid has about 109000 inhabitants in 2015. 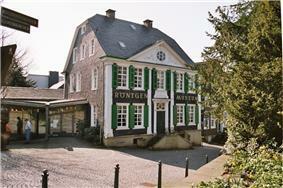 Remscheid was founded in the 12th century, but remained a small village until the 19th century. Early spellings for the city included Remissgeid (1217), Rymscheyd (1351), Reymscheyd (1487) and Rembscheid (1639). The economic growth of the entire Rhine-Ruhr region led to an increase of the population of Remscheid. Mechanical engineering and toolmaking were the main industries practised within the town. This is carried on today with the Hazet tool company which has two factories in Remscheid. Remscheid was part of the Prussian Rhine Province from 1822–1945. On 31 July 1943, during the second World War, Remscheid was almost completely destroyed during a British bombing raid which caused a firestorm. An A-10 Thunderbolt II crashed in the city on 8 December 1988. Six people died. Today, Remscheid comprises four boroughs, Alt-Remscheid, Remscheid-Süd, Lennep, and Lüttringhausen. The Müngstener Brücke is a railway bridge crossing a valley and connecting Remscheid with the neighbouring town of Solingen. 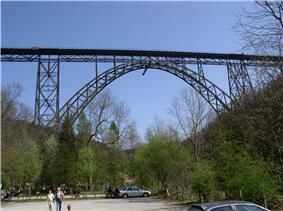 It is 107 m above the ground, making it the highest railway bridge in Germany. It was constructed in 1897 and originally named the Kaiser-Wilhelm-Brücke after Wilhelm I (whose 100th birthday would have been in 1897). The Eschbachtalsperre, the first dam built in Germany for the supply of drinking water is located here. It was built in 1891. 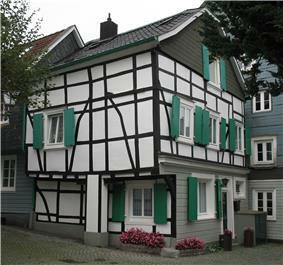 The old city of the borough Lennep consists of 116 houses from 1756. Wilhelm Röntgen, the discoverer of x-rays, was born 1845 in Lennep, which is today a borough of Remscheid. There is a museum in Remscheid (Deutsches Röntgen-Museum) commemorating Röntgen's life and discoveries. Johann Vaillant, founded the famous heating company Vaillant in Remscheid in the late 19th century. Teo Otto, a stage designer, was born in Remscheid in 1904. Karl Michael Vogler, an actor, was born in Remscheid in 1928. Sylvia Rhys, née Sielemann, an opera singer, was born in Remscheid in 1923. Hans Stammreich, a Raman spectroscopist later living in Brazil, was born in Remscheid in 1902. Peter Brötzmann, a free jazz saxophonist, was born in Remscheid in 1941. Frank Plasberg, German journalist, was born in Remscheid in 1957. Wolfgang Tillmans, a photographer, was born in Remscheid in 1968. Georg Wurth, CEO and owner of the Deutscher Hanf Verband (German Hemp Association) (DHV), the largest Organization of the hemp movement in Germany was born in Remscheid in 1972. Milan Lukas Fey, a musician, born in Remscheid in 1992. Wolfgang Seiler, biogeochemists and climatologists was born in Remscheid in 1940. Otto Kuhler, artist and designer of locomotives, born in Remscheid in 1894.